Applications: Duplicates factory look on the following seams: truck beds, tooled door skin, floor pan, core support and any other application in which a non-sag cosmetic seam sealer is required and where fast work time is desired. 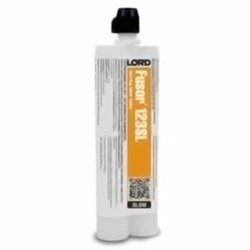 Substrates: Can be used over epoxy and urethane primers. Weld through with minimal burn back. Over 2K primers. Features & Benefits: Extended work time allows for use on larger projects where more time is required. Easy to finish. Also suitable for use where high ambient temperatures cause accelerated cure rates. Full-bodied, non-sag formula. Technical Specifications: Bright white color. Cartridge: 10.1 oz. (300 mL). Work Time: 45 min. @ 70ºF. Paint Time: Immediately or within in 24 hours @ 70ºF. Full Cure: 48 hours @ 70ºF or 45 minutes @ 140ºF. If you have any questions about this product by Lord Fusor, contact us by completing and submitting the form below. If you are looking for a specif part number, please include it with your message.